One or more users of ScoutWiki have decided that this page should be deleted. For other uses, see Match (disambiguation). A match is a consumable tool for producing fire under controlled circumstances on demand. Matches are readily available, being sold in tobacconists and other shops. Matches are rarely sold singly; they are sold in multiples, packaged in either match boxes or in matchbooks. 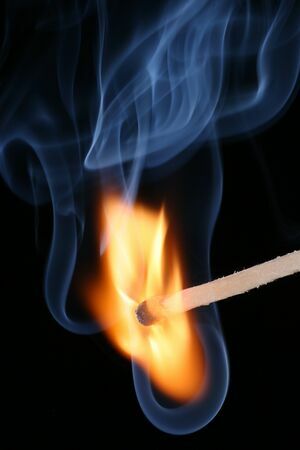 A match is typically a wooden stick (usually sold in match boxes) or stiff paper stick (usually sold in matchbooks) coated at one end (the match head) with a material often containing the element phosphorus, that will ignite from the heat of friction if rubbed ("struck") against a suitable surface. There are two main types of matches: safety matches, which can only be struck against a specially-prepared surface, and strike-anywhere matches, for which any sufficiently rough surface can be used. Match-type compositions may also be used to produce electric matches, which are fired electrically. These items do not rely on the heat of friction. Historically, the term match referred to lengths of cord, or later cambric, impregnated with chemicals, and allowed to burn continuously. These were used to light fires and set off guns and cannons. Such matches were characterised by their burning speed, e.g. quick match and slow match; depending on their formulation, they could provide burning rates of between, typically, 4 milliseconds and 15 seconds per centimetre. The modern equivalent of this sort of match is the simple fuse, still used in pyrotechnics to obtain a controlled time delay before ignition. The original meaning of the word still persists in some pyrotechnics terms, e.g. black match, a black powder-impregnated fuse, or Bengal matches, a type of firework producing a relatively long-burning, coloured flame. When friction matches were developed, however, they eventually came to be the dominant meaning of the term. A predecessor of the match, small sticks of pinewood impregnated with sulfur, was developed in China in 577. The first modern, self-igniting match was invented in 1805 by K. Chancel, assistant to Professor Louis Jacques Thénard of Paris. The head of the match consisted of a mixture of potassium chlorate, sulfur, sugar, and rubber. They were ignited by dipping the tip of the match in a small asbestos bottle filled with sulfuric acid. This kind of match was quite expensive and its usage was dangerous, so Chancel's matches never gained much popularity. The first "friction match" was invented by English chemist John Walker in 1827. Early work had been done by Robert Boyle in the 1680s with phosphorus and sulfur, but his efforts had not produced useful results. Walker discovered a mixture of antimony(III) sulfide, potassium chlorate, gum, and starch could be ignited by striking against any rough surface. Walker called the matches congreves, but the process was patented by Samuel Jones and the matches were sold as lucifers. The early matches had a number of problems - the flame was unsteady and the initial reaction was disconcertingly violent; additionally, the odour produced by the burning match was unpleasant. It is described as a firework odor. Despite these problems, the new matches were responsible for a marked increase in the number of smokers. Lucifers reportedly could ignite explosively, sometimes throwing sparks at a considerable distance. In 1831, Frenchman Charles Sauria added white phosphorus to remove the odor. These new matches had to be kept in an airtight box but were popular. Unfortunately, those involved in the manufacture of the new matches were afflicted with phossy-jaw and other bone disorders, and there was enough white phosphorus in one pack to kill a person. There was a vociferous campaign to ban these matches once the dangers became known. The noiseless match was invented in 1836 by the Hungarian János Irinyi, who was a student of chemistry. In 1836 an unsuccessful experiment by his professor, Meissner, gave Irinyi the idea to replace potassium chlorate with lead dioxide in the head of the phosphorus match. He liquefied phosphorus in warm water and shook it in a glass foil, until it became granulated. He mixed the phosphorus with lead and gum arabic, poured the paste-like mass into a jar, and dipped the pine sticks into the mixture and let them dry. When he tried them that evening, all of them lit evenly. Irinyi thus invented the noiseless safety match and sold the invention to István Rómer, a match manufacturer. Rómer, a rich Hungarian pharmacist living in Vienna, bought the invention and production rights from Irinyi, the poor student, for 60 forints. The production of matches was now fully underway. István Rómer became rich off Irinyi's invention, and Irinyi himself died poor and abandoned in Vértes. The early matches, including the Noiseless match, were dangerous to both the users and the people making them. This was due to the use of white phosphorus. The search for a replacement for white phosphorus led to what was known as the safety match. However, this term is now confusing as it covers both the modern safety match and the modern strike anywhere match. 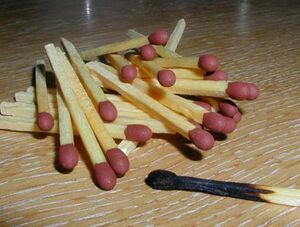 These two different types of matches are discussed separately below. Both of these types of matches were more expensive to make than white phosphorus-based matches, and customers continued to buy white-phosphorus based matches. Laws prohibiting the use of white phosphorus in matches generally had to be passed before these safer types of matches came into widespread usage. Finland banned white-phosphorus based matches in 1872; Denmark in 1874; Sweden in 1879; Switzerland in 1881 and the Netherlands in 1901. An agreement, the Berne Convention, was reached at Berne, Switzerland, in 1906 to prohibit the use of white phosphorus in matches. This required each country to pass laws prohibiting the use of white phosphorus in matches. Great Britain passed a law in 1908 prohibiting its use in matches after 31 December 1910. The United States did not pass a law, but instead placed a punitive tax on white-phosphorus based matches in 1913. India and Japan banned them in 1919; and China in 1925. The safety match was invented in 1844 by the Swede Gustaf Erik Pasch and was improved by John Edvard Lundström a decade later. Their safety is due to the separation of the combustible ingredients between the match head and a special striking surface, and the replacement of white phosphorus with red phosphorus. The striking surface is composed of powdered glass and red phosphorus, and the match head is composed of antimony(III) sulfide and potassium chlorate. The act of striking converts some of the red phosphorus to white by friction heat. The small amount of white phosphorus then ignites, and this starts the combustion of the match head. The Lundström brothers - John Edvard and Carl Frans - had obtained a sample of red phosphorus from Arthur Albright at The Great Exhibition, held at The Crystal Palace in 1851, and made safety matches with it. They misplaced the matches and did not try them until just before the Paris Exhibition of 1855. They were still usable. The Swedes long held a virtual world-wide monopoly on safety matches, with the industry mainly situated in Jönköping. They sold their French safety match patent to Coigent père & Fils of Lyon, but Coigent contested the payment in the French courts, on the basis that the invention was known in Vienna before the Lundström brothers patented it. The British match manufacturer Bryant and May visited Jönköping in 1858 to try to obtain a supply of safety matches but were unsuccessful. In 1862 they set up their own factory and bought the rights for the British safety match patent from the Lundström brothers. Safety matches are classed as dangerous goods, U.N. 1994, and are not forbidden on aircraft, but must be declared as dangerous goods. 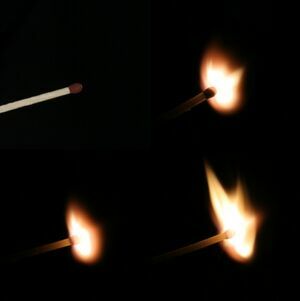 Two French chemists, Savene and Cahen, developed a safety match using phosphorus sesquisulfide. They proved that phosphorus sesquisulfide was not poisonous, that it could be used in a "strike anywhere" match and that the match heads were not explosive. They patented a safety match composition in 1898 based on phosphorus sesquisulfide and potassium chlorate. Albright and Wilson developed a safe means of making commercial quantities of phosphorus sesquisulfide in the United Kingdom in 1899 and started selling it to match makers. In 1901 Albright and Wilson started making phosphorus sesquisulfide at their Niagara Falls plant for the U.S. market, but American manufacturers continued to use white phosphorus based matches. The Niagara Falls plant stopped making it until 1910, when the United States Congress forbade the shipment of white phosphorus matches in interstate commerce. At the same time the largest producer of matches in the USA granted free use, in the USA, of its phosphorus sesquisulfide safety match patents. In 1913 Albright and Wilson also started making red phosphorus at Niagara Falls. Strike-anywhere matches are classed as dangerous goods, U.N. 1331, and are forbidden on aircraft. Since 2005 all matches are prohibited on aircraft in the United States. The development of a specialised matchbook with both matches and a striking surface did not occur until the 1890s with the American Joshua Pusey, who later sold his patent to the Diamond Match Company. The Diamond Match Company was later bought by Bryant and May. The hobby of collecting match-related items, such as matchcovers and matchbox labels, is called phillumeny. The Cocoanut Grove was a nightclub in Boston, Massachusetts. On November 28 1942, the nightclub burned in what remains the deadliest nightclub fire in U.S. history, killing 492 people and injuring hundreds more. An artificial palm tree caught fire when 16-year-old busboy Stanley Tomaszewski struck a match for illumination while changing a light bulb. The case was reopened in 1997, and it was determined that the flash fire was accelerated by methyl chloride leaking from a faulty refrigerator near the Melody Lounge. The King's Cross fire was a devastating underground fire in London on 18 November 1987 which killed 31 people. It was caused by rubbish and grease beneath wooden escalators being ignited, probably by a discarded match. ↑ match. Dictionary.com. Dictionary.com Unabridged (v 1.1). Random House, Inc. http://dictionary.reference.com/browse/match (accessed: February 05, 2007). "History of Chemical Matches". Chemistry.about.com. http://chemistry.about.com/od/everydaychemistry/a/matches.htm. Retrieved November 11. "The History of Matches". Inventors.about.com. http://inventors.about.com/library/inventors/blmatch.htm. Retrieved November 11. "History of matchbooks". Matchcovers.com/first100.htm. http://www.matchcovers.com/first100.htm. Retrieved January 21. "The Rathkamp Matchcover Society". Matchcover.org. http://www.matchcover.org. Retrieved January 21. This page was last edited on 6 May 2012, at 13:38.